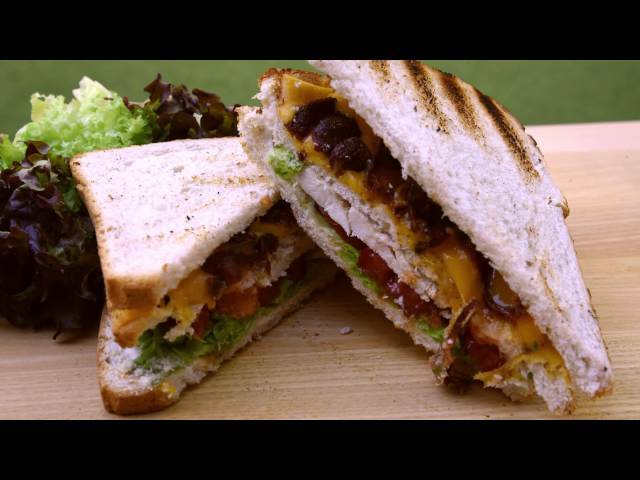 Club SandwichPerfect your Club Sandwich on the BBQ this year! Everything you love about the best BBQ chicken recipes and your favourite club sandwich, brought together in beautiful harmony! Simple, delicious and surprisingly healthy BBQ food ideas for the whole family, cooked-up in no time using just a handful of ingredients. So whether throwing a BBQ party for friends or enjoying a quiet summer evening with the kids, this is one recipe you’ll be coming back to, time and time again! Prepare the cooked fillings you’ll be needing for the sandwich – grill bacon until crisp and cook slices of chicken breast however you like. Alternative, buy pre-cooked ingredients. Grill three thick slices of your favourite bread on the BBQ for an unmistakably delicious flavour. Take one slice of the grilled bread, cover with a layer of cheddar cheese and melt under the grill or in an oven. Spread mayonnaise over the first slice of grilled bread, before adding lettuce, tomato and sliced chicken. Place the cheese-covered piece of bread on top with the cheese side facing up, before adding the crispy bacon and the final slice of bread. Slice and serve, using cocktail sticks to hold the pieces together if necessary.